After four years of training in pottery making at the Institut des arts appliqués de Montréal, Louise Bousquet set up her first pottery studio in 1975. Her goal: to create something white. Louise has practiced her craft with a passion for 30 years, innovating as she boldly pursues her quest for whiteness. Her fine wheel-throwing and the harmony form and function found in her pieces soon attracted a clientele who has remained very loyal. 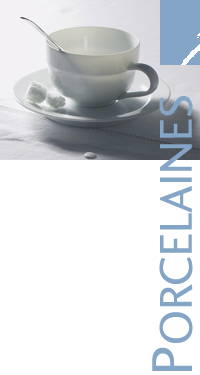 Her determination and her quest for white took her all the way to Limoges in 1998. It was there that she studied the industrial process and materials involved in making fine porcelain and adopted them to her craft in her own way. It was also there that she met Guy Meynard, porcelain and mould maker, who has been instilling the spirit of porcelain in her ever since. With Guy and her spouse François Godier, "fine technical thinker," Louise founded Porcelaines Bousquet Inc. in 2002 and in the summer of 2003 production began of pieces signed Porcelaines Bousquet crafted according to the finest standards of porcelain-making. The proper skills for making ceramic objects are the result of a long tradition that fortunately is still being passed down through the generations, skills that are acquired and refined in harmony with a respect for clay as a medium. Of quality comparable to fine European china, Bousquet porcelain is designed to adapt comfortably to our customs here and, above all, to everyday use. Some of the pieces are particularly indicative of Louise Bousquet’s mastery of porcelain-making techniques. 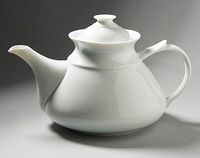 The teapot, for example, is light and dainty and its spout is guaranteed to catch the last drop. helped in the creation of this site. Thank you!